During an interview on fox news with Laura Ingraham, Roger Stone, a long time Trump associate stated clearly that he will not bear false witness against anyone. "My comment on ABC may have been misconstrue, what i meant was that i'm not going to bear false witness against anybody. I am going to tell the truth under oath to the investigators if they have questions." "But i'm not going to do what Michael Cohen has done, i'm not going to make up lies or bear false witness against Donald Trump or any one else." Stone added. 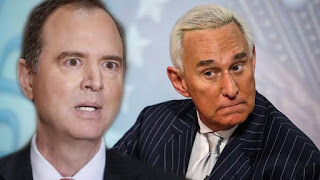 Stone then challenges Adam Schiff to a 'Truth Contest' by saying "Even though i'm accused of lying, when i get Adam Schiff on the stage, when i get other members of the community on the stage i'll demonstrate that they're the ones who are lying and not me"
Related article: Witch-Haunt!! ROBERT MUELLER INDICTS FORMER TRUMP ADVISER ROGER STONE ON MULTIPLE CHARGES IN RUSSIAN COLLUSION.